At Hartford Elementary School, Mrs. Holloway had the chance to spend two years with some of her students. An opportunity that would take her family to Texas didn’t pan out and as you’re about to read, for one student, Mrs. Holloway’s change of plans may have happened for a reason. One of those kids is Karson. He was diagnosed with dyslexia, but not until his first grade year in Mrs. Holloway’s classroom. 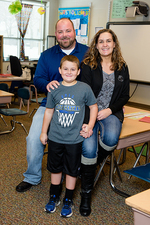 “To be honest, if she wasn’t his teacher for the second year in a row, if he had a different teacher in first grade, I fear that we wouldn’t be where we are now,” said Karson’s dad, B.J. Olson. 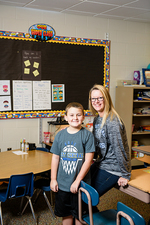 Mrs. Holloway noticed some things with Karson in kindergarten, but when they carried over to first grade, she knew something needed to be done. “We saw some warning signs, so we got him tested and he was diagnosed as dyslexic,” said Mrs. Holloway. Karson is now in second grade, but still spends plenty of time with his old teacher. She tutors him outside of regular school hours, even during the summer. And while Karson learns so much from Mrs. Holloway, she’s gained some life-long lessons as well. As for the 2016 Teacher of the Year nomination, the Olson’s want Mrs. Holloway to know she’s appreciated. “I think she should be recognized for the extra effort she put forth when she didn’t need to,” said Mindy Olson, Karson’s mom. For Karson, he’ll continue having fun with Mrs. Holloway on their football rivalry and he’ll continue smiling knowing she’s making an impact on his life. So while this story continues, Mrs. Holloway will always leave her bookmark on this chapter of Karson’s life. “When you think back on your favorite teacher, they’re friendly, or a coach,” said B.J. “But I think Karson, even when he’s in college, he’ll still remember Mrs. Holloway for what she was able to do."